I should start out by noting that when it comes to carry, I choose Glock. We can argue over and back again, but my experience has brought me to this position after a long (and expensive) road. You most likely won’t change my mind, and after this, I probably won’t change yours. 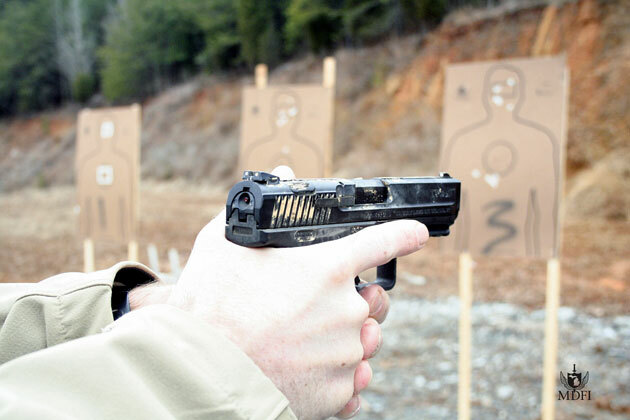 What is important however, especially as a firearms instructor, is taking some in-depth looks at other options in the defensive handgun market. When Brandon told me about his newest handgun purchase and his initial thoughts, I was intrigued. He had just purchased the newly released Canik TP9SA as imported from Century Arms International. This “duty-sized” handgun is touted as being of quality construction, a reliable and accurate shooter, with one of the best out of the box striker fired triggers that he had shot in a long time. After a brief discussion, it was on its way to MDFI for some trigger time at an upcoming two-day hard-use class with in North Carolina. Just after the gun arrived in Michigan, I had the opportunity to give it a quick off-range once over at ATEi near Detroit. The TP9SA is a solid feeling striker fired polymer framed handgun that has a very “Glock” look to it. Nothing immediately jumped out at me aside from two things. The trigger, as previously mentioned, was very nice. It was certainly better than any off the shelf Glock that I had ever had the opportunity to try. As I was admiring the trigger press, I noticed a strange “button” on the rear of the slide just in front of the rear sight. This button quickly had my utmost attention. By pressing this button, the striker system “decocks” rendering the pistol incapable of firing until the slide is cycled manually. As someone who has personally witnessed and encountered magazines release from unintentional presses while in duty gear, the idea of a large, prominent “button” that could render a fighting pistol into a rock with a bump set off immediate red flags. While still keeping an open mind, the TP9SA was quickly handed off to Steve at Persec Systems for a custom holster and double mag carrier. During the stay at Persec, Steve noticed an interesting and possibly concerning issue with the trigger on the TP9SA. The very “Glock” trigger on the TP9SA would fire without the center safety depressed. At close review (as shown in the Monderno TP9SA Safety Warning) the detent was not long enough to contact the frame inside the trigger guard to stop an “unintentional” trigger movement. Although not a world ending issue in a world where trigger discipline should be in effect at all times, if you are going to tout a safety feature – make sure your safety feature works. Monderno made contact with Century Arms to coordinate a return to the importer as soon as possible to have the trigger looked at. 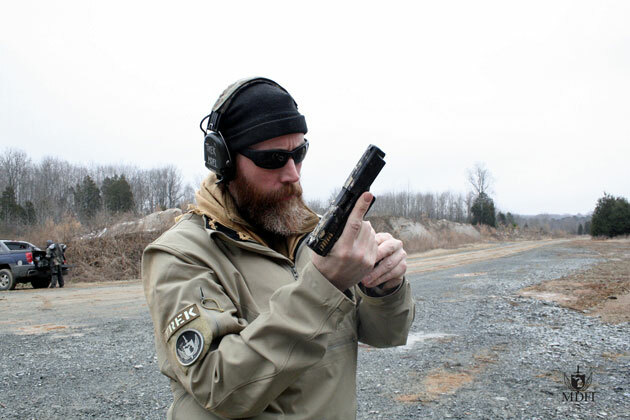 With a new holster set in hand after a return from Persec, the TP9SA made the trip to North Carolina where Solo Defense had agreed to host MDFI for our Handgun: Movement and Cover and When Things Go Bad classes. Both of these classes focus on keeping the gun up and running through all sorts of shooting positions and unpleasant situations. 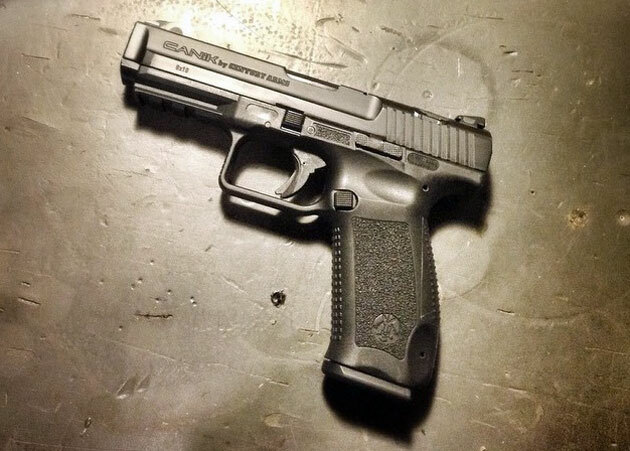 During the two days of shooting, the TP9SA performed…well…Glock-like. The 9mm duty gun shot very well without a single issue running Great Lakes Ammunition training ammo. It functioned flawlessly covered in mud, soaking wet, and shot point of aim with its very “Glock-like” sights. It proved a very “soft shooter” and was enjoyed by others who had the chance to try it out. The only issue that was encountered in the two days on the range sent a very real chill down my spine just after it was encountered. After a demonstration in front of the students and once the TP9SA was safely back in the holster, I made a slight adjustment to the holster on my Ares Gear Aegis belt when my Sordin electronic ear protection picked up the slightest, “click.” I knew just what had happened. While making the adjustment to my holster, I had accidentally bumped the decock button on top of the TP9SA, rendering it a dead gun. A quick attempt to engage a target proved that had I needed the gun to fire, immediate action would have been my only friend in a bad situation. 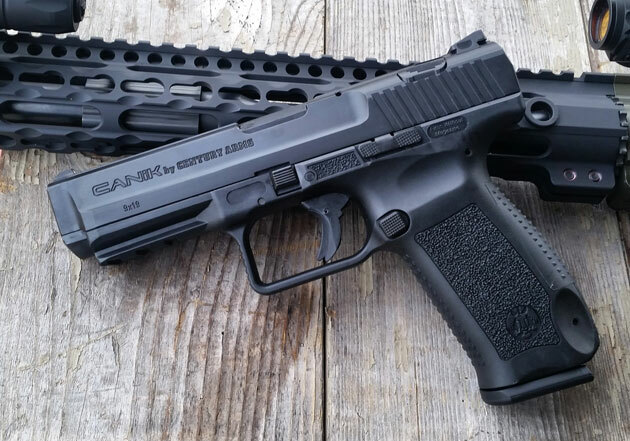 Once back from the course, the TP9SA went back to Century Arms to have the trigger looked at. It returned a few weeks later with a new trigger part and all was shiny with the world. For someone who is self-admittedly a “Glock guy,” I found all aspects of the TP9SA to be quite agreeable…aside from one. And due to that one issue, I would not recommend anyone use that variant as a defensive weapon to be carried on a moving, bobbing, weaving, compressing, flexing human body in a world of things that love to jab, poke, and snag. News from Century Arms is that a new non-decock variant is available for purchase at a very reasonable cost of around $300. I also was very interested in the Canik TP9-SA after watching a few YouTube videos. The reviews were good and the MSRP was outstanding. You really couldn’t go wrong with buying this firearm. One thing was stopping me from picking one up. The De cocker was huge then being on top of the slide also. That was just asking for trouble if you choose to have it be your EDC. There still hope. Canik is in the process of coming out with a new model TP9-SF which will not have the de cocker. The new model should be available in the U.S. Fall 2015. The price point is still unknown but if it’s the same as the TP9-SA I will definitely be picking one up. Curious if having a custom holster made for hard use why not cover the decocker? Seems a simple fix for barely a tradeoff on speed? Im just waiting for that one time the buzzer goes of and the triggers dead. I love the gun. They have a great trigger and the accuracy is above what you would expect for a 300.00 handgun. It begs for better sights and its unfortunate they went with the dovetail set up they use . I am looking forward to adding one to the collection without the decocker.